As we approach the 9th anniversary of the 9/11 attacks on our country, I am reminded how distracted we have become from the culprits of this tragedy. In my opinion, today’s media attention and national debate focused on a mosque near ground zero or a radical Florida pastor’s Quran burning stunt have taken our eyes off the ball. We have cast a wider net over all Muslims instead of remembering the radical ones who departed from the peaceful teachings of Islam and chose to destroy human life and property. 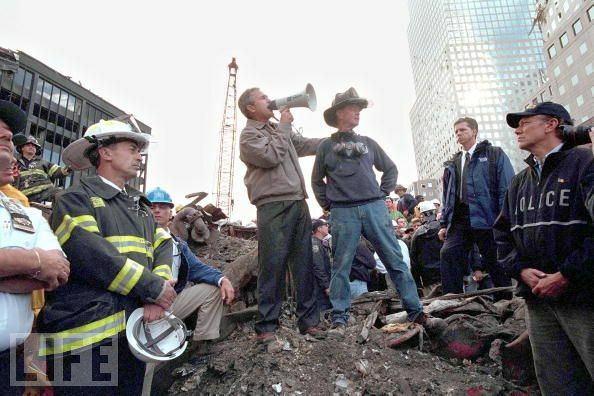 When President George W. Bush stood atop a fresh pile of rubble holding a cranked up megaphone at Ground Zero on September 14, 2001 and declared the following: “I hear you. . .and the people who knocked those buildings down, will hear all of us soon” the “people” he was referring to were radical terrorists. That historic moment had focus and clarity. There was anger and resolve in the crowd. There were no doubts about what happened and who was responsible. The message was clear: terrorists did this and we will respond. As we light a candle and reflect on another 9/11 anniversary, we need to remember first and foremost the 2,996 innocent human lives that were taken. Secondly, we need to remember the culprits of this tragic event along with those who continue to participate in, support, train, harbor, finance, and celebrate cowardly acts of destruction against humanity. I believe we as a nation need to re-direct the focus of our anger, condemnation, and resolve upon those who choose destruction over peace so that others who are grateful to freely worship in our nation may be left alone and respected. We need to return to that pile of rubble and remember the bastards who did this to us. Nothing more. Nothing less.